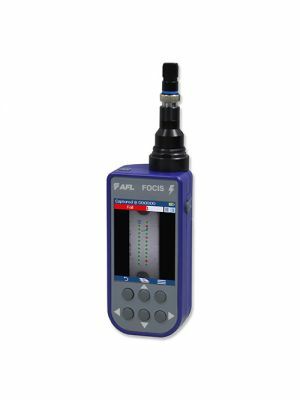 FOCIS Lightning is a self-contained multi-fiber connector inspection probe with integrated screen. It is intended specifically for the inspection of multi-fiber connectors and bulkheads such MPO and MTP® including multi-row varieties. The FOCIS Lightning can perform industry standard and user-defined end-face cleanliness analysis at a rate of about 1 second per fiber. Lightning stores connector level and individual fiber images, analysis, overlays, and zones tables locally and provides both WiFi and Bluetooth wireless links. The AFL FOCIS app (iOS and Android) provides a comprehensive and user-friendly feature set as well as connectivity with AFL's cloud-based aeRos® workflow automation platform. Pass / fail results in seconds: With the press of a single button, the FOCIS Lightning auto-focuses, captures, centers and analyzes the multi-fiber end-face image to industry standard and user-defined criteria. Untethered operation: With rechargeable battery and integrated 2.4" TFT color LCD screen, FOCIS Lightning can be used independently. Multi-fiber front-end adapter tips: Multi-fiber front-end adapter tips support single row and multi-row MT connector inspection for a wide range of patch cords and bulkhead-mounted connectors having either PC/UPC or APC polished end-faces. The probe snout includes a key which in combination with a slot on the adapter tips ensures that adapter tips never loosen during use, under any circumstances.